Efficient DC to DC and DC to AC converters play a vital role in the reliable performance of standalone and grid connected photovoltaic systems. 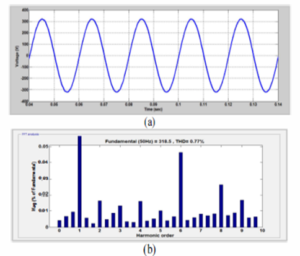 This paper deals with DC to AC conversion by a seven level cascaded H-bridge multilevel inverter for a standalone photovoltaic system. The PV fed seven level cascaded H-bridge multilevel inverter is analyzed in two ways: 1) with equal voltage sources as input to the H bridges and 2) with unequal voltage sources as input. 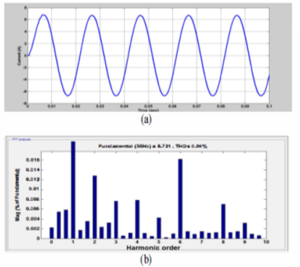 A comparative study of the total harmonic distortion reduction in the PV fed multilevel inverter system with and without equal voltage sources as input is carried out. It is observed that with unequal voltage sources, the total harmonic distortion is increased than that with equal voltage sources as input to the PV fed seven level cascaded H-bridge multilevel inverter. 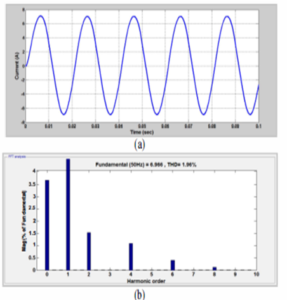 Further, the study attempts to show that with an LC filter at the output stage of the multilevel inverter, the total harmonic reduction is significantly reduced and the power quality of the PV fed multilevel inverter system is highly improved. Results are verified using simulations done in MATLAB/Simulink environment. 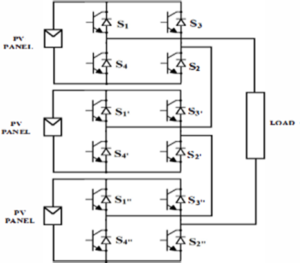 In this paper, an analysis of a seven level cascaded H bridge multilevel inverter for a standalone photovoltaic system is carried out 1) with equal voltage sources as input to the H-bridges and 2) with unequal voltage sources as input. It is found that when equal voltage values are fed as input to the H-bridges of the multilevel inverter, there is a reduction in the total harmonic distortion of the MLI output when compared to that with unequal voltage sources as its input. It is also observed that with an LC filter at the output stage of the multilevel inverter in both the scenarios, the total harmonic reduction is significantly reduced and the power quality of the PV fed multilevel inverter system is highly improved. 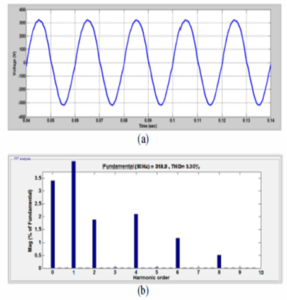 Venkatachalam, Jovitha Jerome and J. Karpagam, “An experimental investigation on a multilevel inverter for solar energy applications,” International Journal of Electrical Power and Energy Systems, 2013, pp.157-167. 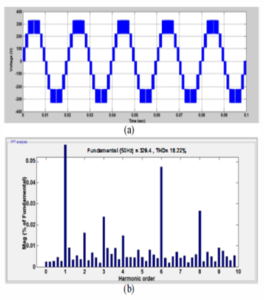 Ebrahim Babaei, Mohammad Farhadi and Farshid Najaty, “Symmetric and asymmetric multilevel inverter topologies with reduced switching devices,” Electric Power Systems Research, 2012, pp. 122- 130. Jia-Min Shen, Hurng-Liahng Jinn-Chang Wu and Kuen-Der, “Five-Level Inverter for Renewable Power Generation System, IEEE transactions on energy conversion,” 2013, pp.257-266. 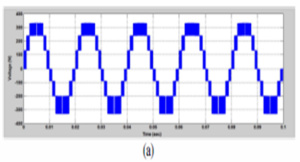 Hui Peng, Makoto Hagiwara and Hirofumi Akagi, “Modeling and Analysis of Switching-Ripple Voltage on the DC Link between a Diode Rectifier and a Modular Multilevel Cascade Inverter (MMCI),” IEEE transactions on power electronics, 2013, pp.75-84. 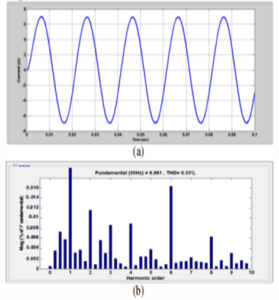 Javier Chavarria, Domingo Bie!, Francesc Guinjoan, Carlos Meza and Juan J. Negroni, “Energy-Balance Control of PV Cascaded Multilevel Grid-Connected Inverters Under LevelShifted and Phase-Shifted PWMs,” IEEE transactions on industrial electronics, 2013, pp.98-111. 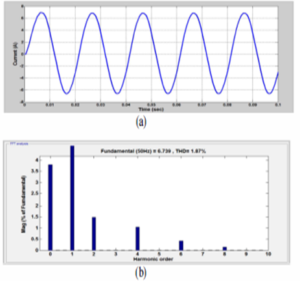 This entry was posted in Blog, scribd, slideshare, website and tagged Cascaded Multilevel Inverter, DC to AC converters, H-bridge multilevel inverter, Photo voltaic Array (PV Array), Power Quality Analysis of a PV fed Seven LevelCascaded H-Bridge Multilevel Inverter, Pulse Width Modulation (PWM), PV fed seven level, Total Harmonic Distortion (THD). Bookmark the permalink.